You know that way pop stars these days suddenly drop an album out of the blue that no one knew they'd been recording, and everyone gets really excited? Earlier this year, I was waiting for my agent to sort out the Westphall deal with Mulholland, not sure what to do with my writing time. I started on a surreal, Murakami-esque spy thing entitled The Seven Faces of Elizabeth Bishop, but kind of got bogged down about a hundred pages in. And anyway, all the time I was thinking, what exactly are we going to do with this, if I get the Westphall deal? So, instead I decided to write another Barney Thomson. Having not really thought about it in a long time, it suddenly seemed like a good idea. Getting enmired in the Bishop story had been depressing me, and writing dear old Barney provided some light relief. Once I signed with Mulholland, and things were happening pretty quickly, it looked like I might not have a window to release it, but since they pushed back the release of Westphall 1, SONG OF THE DEAD, until February next year, they’ve kindly okayed the release of BALLAD IN BLUE and Barney 8 this month. So, here it is. 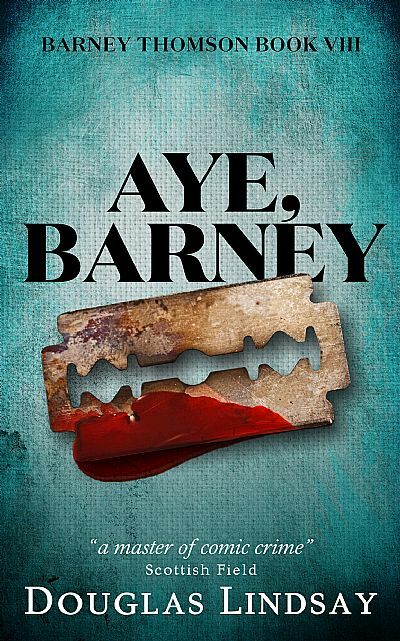 AYE, BARNEY, the eighth book in the Barney Thomson trilogy. Link to digital edition via the image. Paperback edition link here. Something rotten is happening in the town of Millport, on the island of Cumbrae. Plans are being made, money is being thrown around, an empire is being built… and people are getting murdered. A man has a stiletto thrust into his eye socket, another his windpipe brutally squeezed shut, whilst a kidnapped youth lies curled in a cage, unaware of what it is that lives inside him. Comment from Wally Dug at 08:59 on 22 September 2018. Fantastic! But will there be an old-fashioned print copy? Yep, there is. I was a muppet and didn't include the link. I've added it above. Only available through Amazon, I'm afraid. They should link the ebook and print pages, but haven't done it yet.